The marketing function (at least as most business executives define it) has been undergoing substantial change over at least the last 10-15 years. Traditional communication mechanisms are no longer sufficient to create the environment to make profitable sales. The reasons for this are multi-pronged. Increased competition, information, commoditization and complexity have formed a great barrier to a company’s ability to connect with its desired customers. In this two-part post I will share you with a new paradigm of marketing – what I call “The New Marketing Funnel” – that will enable you to transform old, ineffective forms of marketing to critical drivers of growth. In this post I will focus on introducing The Funnel and highlighting some critical errors of more traditional approaches. In my next post, I will share how to put The Funnel to work in your business. While this post highlights my experience and take on this issue, I did not originate the idea (my apologies for not being able to remember the people who inspired this insight – I’d like to give proper attribution). Various marketing prognosticators have been talking about the need to focus on customer niches, establish connections and to co-create. This post, and my approach, is unique because it looks at how The New Marketing Funnel connects to the pre-sale phase, the selling process and the post sale process. 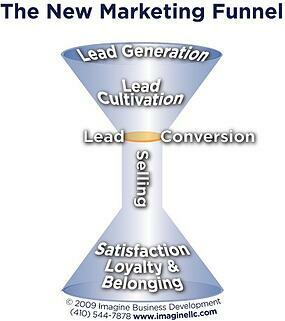 Traditional marketing has focused, almost exclusively, on only the first part of The New Funnel – lead generation. It then paid lip service to lead cultivation and conversion. The reality in most small and mid-sized business enterprises (SMEs) is that the area between lead generation and the selling process could best be described as The Land of Mutual Mystification. This resulted in a poor definition of lead generation and resulted in accelerated commoditization. Lead Cultivation: The activities that allow your business to build a connection with those who are aware of you. This is where your positioning is established – where you have the opportunity to truly differentiate yourself (many times this is the only place where you have the opportunity). This is also the place where you can create demand. Lead cultivation should be designed to attract the right buyers to your offering – while repelling the wrong ones. Lead Conversion: This is the point in the cycle where a selling and/or buying process is kicked off. The nature of the conversation changes from the general to the specific. Problems are clearly identified and the conversation becomes focused on key problems and issues. This is the point where traditional marketing let businesses down and accelerated commoditization. While sales and marketing departments were talking about “lead generation,” companies defined a lead as one who was willing to enter a sales conversation – this is lead conversion not lead generation. This is why marketing communication became more about the “we-do's,” features and stuff that businesses did, rather than on enabling buyers to feel understood. The focus on the conversation (and most websites) is too far down the cycle. Selling Process: This clearly defined process is where buyer and seller are in a direct conversation about uncovering, understanding and solving problems. Satisfaction, Loyalty & Belonging: Post sale is another place where traditional marketing let businesses down. Sure, it paid lip service to satisfaction and loyalty, and marketers discussed things like enhancing the client experience, but it never really lived up to the promise. The post sale process is where you secure your customer/client base and stimulate loyalty and word-of-mouth. The problem with most word-of-mouth is that it happens by accident and isn't guided. Effective post sales marketing stimulates and guides effective word-of-mouth. In the next post, I will share with you how to utilize The New Marketing Funnel to guide your strategy and tactics.